At the USC Leonard Davis School of Gerontology, students study the human lifespan by exploring the physiological, psychological, sociological and behavioral dimensions of adult life. Here, Michael Zuletta and Sade Ojuola view works at the Sophie Davis Gallery, which regularly features art created or inspired by older adults. Photo by John Skalicky. Founded in 1975, the USC Leonard Davis School is not only the nation's premier school of gerontology, it is also the first. Named in honor of Leonard Davis, a philanthropist and businessman who pioneered insurance plans for the elderly through his involvement in AARP and his own company Colonial Penn Life Insurance, the school provides ground-breaking solutions to issues facing an aging population. The Davis School is committed to providing students with a broad theoretical understanding of lifespan development as well as dynamic post-graduate career placement. Students on all levels often enroll in semester-long internship programs. Working with our internship director, students can apply their gerontological knowledge to an array of industries such as health, medicine, business, finance, policy, direct services, program development, counseling and many other fields. The USC Leonard Davis School of Gerontology offers a Bachelor of Science in Human Development and Aging, a Bachelor of Science in Lifespan Health, undergraduate classes through the health and humanity major in the USC Dornsife College of Letters, Arts and Sciences, two minors in gerontology and a progressive Master of Science in Gerontology open to all undergraduate students. The school offers several graduate degrees including a Master of Science in Gerontology; a Master of Aging Services Management; a Master of Arts in Gerontology; a Master of Long Term Care Administration (with the Marshall School of Business and the Price School of Public Policy) and a Master of Science in Nutrition, Healthspan and Longevity. All master's degrees are offered online and onsite. The Davis School of Gerontology offers the premier PhD in Gerontology program in the nation and also offers a PhD in the Biology of Aging. The PhD programs are not offered online. Non-degree graduate students may complete 16 units of gerontology and be awarded a graduate level certificate in gerontology (also available online). The two minors include the social science-focused Individuals, Societies, and Aging and the health science-focused Health, Science, and Aging. The progressive degree program allows high performing students to integrate their current undergraduate major with a Master of Science in Gerontology. Students with at least a 3.0 overall GPA may apply for admission to the degree program in their junior year. Students will meet with the gerontology student adviser to develop a course plan that must be approved by the School of Gerontology and the student's home department. Students admitted into the progressive degree program begin taking master's level courses in their senior year and will complete the master's degree in year five. For more information on the admission process, see the gerontology student adviser. For further details on progressive degree programs, see the Requirements for Graduation page. A progressive degree program allows qualified undergraduate students the opportunity to complete an integrated program of study joining a bachelor's degree and a master's degree in the same or different departments. The progressive degree program in gerontology allows students in their junior year to apply for the Master of Science in Gerontology program and complete both degrees in five years. Students must fulfill all the requirements for both the bachelor's degree and the master's degree. The total number of units for the master's degree, however, may be reduced by a maximum of one third. Students must obtain permission from both the bachelor's degree granting program and the USC Leonard Davis School of Gerontology. This program may be particularly attractive to students majoring in biology, psychology, policy and sociology. For more information on progressive degrees, see the entry under Undergraduate Programs or Graduate and Professional Education . Dual degrees currently available are the Master of Science in Gerontology and the Master of Business Administration (MS/MBA) with the Marshall School of Business; the Master of Science in Gerontology and the Juris Doctor (MS/JD) with the Gould School of Law; the Master of Science in Gerontology and the Master of Public Administration (MS/MPA), the Master of Science in Gerontology and the Master of Health Administration (MS/MHA), and the Master of Science in Gerontology and the Master of Planning (MS/MPl) with the Price School of Public Policy; the Master of Science in Gerontology and the Master of Social Work (MS/MSW) with the USC Suzanne Dworak-Peck School of Social Work; and the Master of Science in Gerontology and the Doctor of Pharmacy (MS/PharmD) with the School of Pharmacy. Students must apply to both schools and if accepted to both, participate in specially designed programs combining the courses of each school. The MS/MPl dual degree is one of few in the nation which combines the knowledge of the older population with the skills needed to plan services for older people. The MPl prepares the graduate for the responsibilities involved in development of public and private institutions and programs. The MS indicates a special focus on the older person and the skills to analyze and design programs for this growing population. 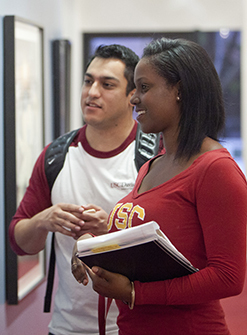 See the USC Price School of Public Policy for course requirements. See Master of Social Work/Master of Science, Gerontology for requirements. The MS/JD dual degree combines the knowledge of the older population with understanding of the legal system. The program prepares graduates for a number of roles in both public and private sector organizations. Students are required to complete 110 units of course work, 74 from the Gould School of Law and 36 from the Davis School of Gerontology. The first year is devoted to required law courses, and the second, third and fourth years combine gerontology and law courses. To earn the JD, all students (including dual degree students) must complete 35 numerically graded law units at USC after the first year. The associate dean may make exceptions to the rule for students enrolled in the law school honors program. See the USC Gould School of Law for course requirements.